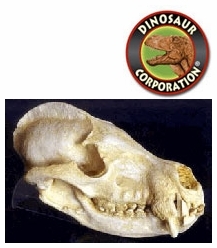 Museum Quality Procyonidae Skulls: Coatimundi Skulls, Kinkajou Skulls, Raccoon Skulls. Procyonidae is a New World family of the order Carnivora. It includes the Raccoons, Coatis, Kinkajous, Olingos, Ringtails and Cacomistles. Procyonids inhabit a wide range of environments, and are generally omnivorous. Procyonids are smallish animals, with slender bodies and long tails. Except for the Kinkajou, all Procyonids have banded tails, and distinct facial markings. These are especially visible in the Raccoons. Like Bears, Procyonids are plantigrade, walking on the soles of their feet. Most species have non-retractile claws.